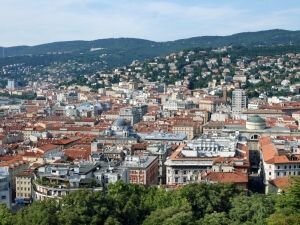 Trieste is a city in northeastern Italy. The city is situated on a narrow strip of land between the Adriatic Sea and the Italian border with Slovenia. Due to its location, being a crossroads, Trieste was influenced by German, Roman, Austro-Hungarian and Slavic culture. This has contributed much to the development of a multicultural city. The city has a population of about 205 000 people. Trieste is located in the Gulf of Trieste and is the capital of the province of Trieste. Originally the city was an Illyrian settlement. From 177 BC, Trieste was completely under Roman control. It had the status of a colony of Julius Caesar. At that time the city was called Tergeste. Trieste was turned into a military colony. Roman Tergeste was a thriving city, which was a very important Roman port. In early Christian era, it remains a thriving center. After the Western Roman Empire, in 476, Trieste was a Byzantine military outpost designed to protect against invaders. In 567, the city was destroyed by the Lombards in their invasion of Northern Italy. In 788, it became part of the Frankish kingdom. After centuries, Trieste had become one of the oldest parts of the Habsburg Empire. 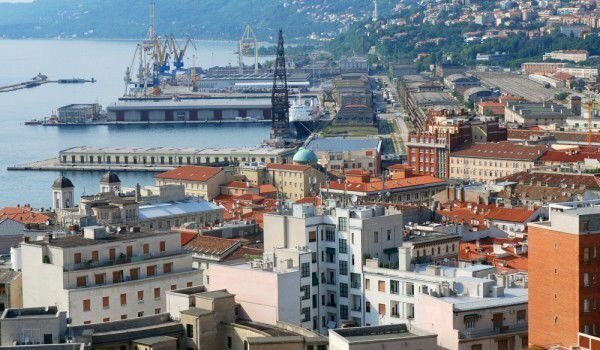 In the nineteenth century, Trieste was the most important port of one of the Great Powers of Europe. As a prosperous port in the Mediterranean region, Trieste became the fourth largest city of the Austro-Hungarian Empire. The city had emerged as an important musical and literary center, here came some of the biggest names in literature and music. Trieste was occupied by French troops three times during the Napoleonic wars, in 1797, 1805 and in 1809. Between 1809 and 1813 the city was part of the Illyrian provinces interrupts its status as a free port and loses its autonomy. After the Napoleonic Wars, Trieste continued to prosper as a free city. The role of the city as a major Austrian commercial port and shipbuilding center later becomes even more important with the establishment of commercial shipping. By 1913 the Austrian fleet comprises of sixty-two ships. In Trieste, to the early nineteenth century was spoken the dialect Tergestino. Then this dialect is called Triestina. In the early twentieth century, Trieste became a cosmopolitan city, frequented by famous artists and philosophers from different European countries. Trieste was officially part of the Kingdom of Italy in 1920. The collapse of the Austro-Hungarian Empire and the Union of Trieste in Italy after World War II led to some decline in the multi- European cultural importance of the city. After the emergence of the fascist regime in 1922, in the city was forbidden to use the Slovenian language. Several thousand Slovenes of Trieste, mostly intellectuals, immigrated to South America, where they sought refuge and a better life. In the thirties of last century the town enjoyed an economic revival. During the Cold War Trieste was important in the struggle between the Eastern and Western bloc. Today it is one of the richest regions of Italy and is a major shipping center. During the Nazi occupation, in Trieste was built a concentration camp, where they killed about three thousand Jews. In 1947 was outlined the Free Territory of Trieste. This completely changed the fate of the city. Today it is one of the major tourist attractions of Italy and attracts many tourists from around the world. There are fabulous views, wonderful places for hiking and local specialties, which can be found only here.